We had a blast at O You! on Saturday. Thank you to O magazine and OWN for putting on a great show. The Convention Center in downtown Los Angeles was filled with fun activities (like getting our hair curled and nails polished) and lots of free swag. 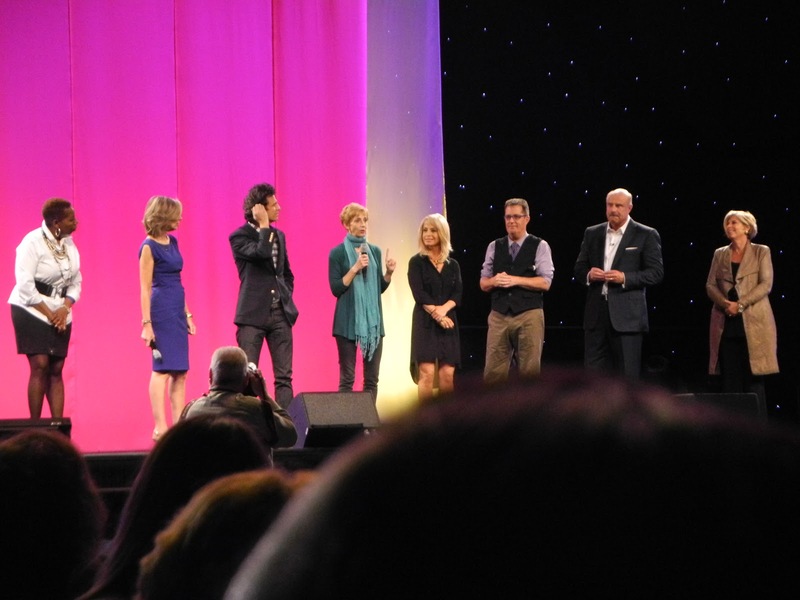 We ran into friends we made at Lifeclass last spring including all the OWN Ambassadors. It was fun to reconnect. But the day was also filled with inspiring talks and sessions with some of Oprah's experts from the magazine and the network. At then end of the day, they all got up and told us what they "know for sure" and we wanted to share that with you. "When you undervalue who you are, the world will undervalue what you do. And when you undervalue what you do, the world will undervalue who you are." "Our world is changing and you gotta play big in your life, because if you don't star in your life then you have a life without a star. Because nobody else is going to star in your life. Do not let your life go by without somebody staring in your life. It has got to be you. Play big and be a star in your own life." "When you de-clutter, whether it's in your home, in your head or in your heart, it is astounding what will flow into that space that will enrich you and your family." "Love is the purest, most honest, most energizing source in the universe and the only thing that blocks love is fear. And when can you let go of the fear and take a chance at life and love, then you will let the love in and you will feel it flow and you will be in your essence. That's my hope and my wish for you and the love starts by loving yourself first." "Think of something you want. I don't know for sure if you're meant to have that. Now think of something you yearn for. What I know for sure is that that yearning is telling you that you are absolutely meant to have what you yearn for. And if you reach down inside yourself, you'll learn that the yearning you feel is telling you that you know that for sure, too." "Looking great on the outside starts inside. Sure a pair of spanks and a little black dress can contribute to a really cute outfit, however if you're unhappy in your inside, you will never really feel beautiful, alive and wonderful. Confidence is really your best accessory." "Real beauty has nothing to do with symmetry or weight or make-up. Real beauty is looking life right in the face and seeing all its magnificence reflected in your own." "All things are lessons that god would have you learn and that the best student get the hardest tests. So that as you move through life the lesson is to enjoy every moment, of every lesson, of every blessing, of every test. Because if you don't enjoy your life, sorrow, sadness, suffering, fear, shame and guilt will."